This review of Leap Motion technology is meant to look at the product from several angles and will hopefully provide those considering purchasing the product with some food for thought. Attempting to review Leap Motion without giving a brief description of the product would be silly; so, here it goes. 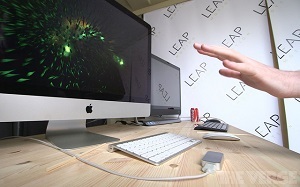 Leap Motion is a new sensory device that can be used with a pc or mac. The device itself is small, only about three inches long and one inch high, but creates a field of three dimensional space above it for your hands to work. The sensor detects movements from your hands and allows you to perform actions like scrolling, picking up and dropping and grasping things on your computer screen. 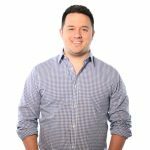 The device is not meant to replace a keyboard or mouse but is designed to cohabit your desk space with these other items. The device costs $80 and is sold on Leap Motion’s site as well as Best Buy, Amazon and several other retailers. The first pro is the price. $80 for a brand new technology is a pretty sweet deal (when it works out). Another great thing about the product is its sleek and small design. Apps that work well with the technology can be found and purchased on the Leap Motion site; this makes finding ways to use your new little gadget easy and enjoyable. The next pro would have to be the sensitivity of the software. The leap motion is claimed to be “200 times more accurate than Microsoft’s Kinect” (according to a review on VentureBeat.com). This is pretty amazing stuff if you really think about it! When it works the way it should, the leap motion can detect even the slightest movement of your hands, allowing you to interact with your computer on a more human level by using natural hand motions to control your experience. The sensitivity that the Leap Motion designers have achieved in this project lends itself to founding more realistic hopes about future products like this. What we mean here is that this is a great step in the right direction. While the Leap Motion sensor is a great “in theory” kind of device come to life, it’s definitely not the best it could be and still has a lot of glitches to be worked out. Thankfully, it seems like the creators of the product realize this is the case and are constantly working to update the software. Most likely, within the next few years, there will be a new version of this product (that claims to be even better) out on the market. So, what’s the issue? The sensitivity. Yes, we know we listed that as a pro, and while it is a great achievement, it’s also (at least for now) a con. The sensitivity of the device picks up everything. 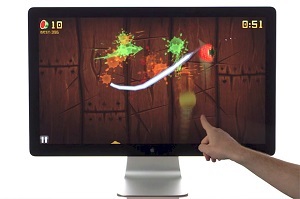 Leap Motion is sort of like a mastermind with no self control. It knows what’s going on but is not always quite sure what to make of the information. This lends itself to creating a kind of chaotic experience. Until the designers can create a way for the product to be just as sensitive but a little more wise, Leap Motion may cause more headaches than help. And while it’s not a ridiculous amount of money to spend on new technology, for the way it works now (and doesn’t work some of the time) putting out the $80 bucks should be thoughtfully considered. A Year in Review: What Can We Learn From SEO Trends in 2013?